These Golden Wonder fully flavoured Sausage & Tomato crips remind me of a favourite sandwich of mine. Who doesn't like Tomato Ketchup on a sausage sandwich? Okay, so it's not for everyone… Looking back when I first started work in a factory after college, I treated myself to a sausage sandwich every Friday morning from the greasy van that was parked up nearby on the trading estate. Not so healthy though, as I put on a few stone and had to work it all off at the gym! 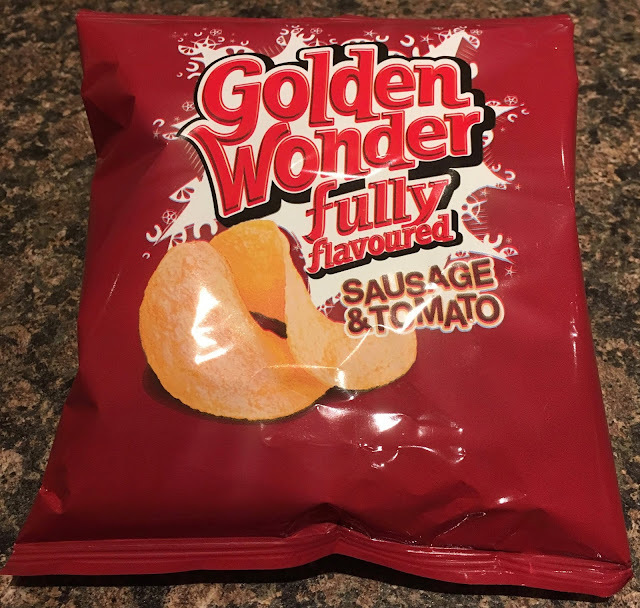 Okay, so these Golden Wonder Sausage & Tomato may not be new crisps, but we haven't seen them in years. They must have been hiding somewhere. Strangely though I do find many Golden Wonder crisps aren't readily available, which is a shame as they're generally really tasty. On opening the packet there is a good smell of tomato mixed with the less dominant smell of sausage meat. On taste these crisps really do explode with flavour. It's hard to say which comes first, as the sausage flavouring merges perfectly with the tomato like someone has gone mad with the Ketchup on their sausage sandwich (which I always do, of course)! Unless I'm mad, these crisps really do taste of sausage and tomato. I checked the back of the packet for a double take on the vegetarian friendly aspect of the crisps. Not that it applies to me, but I didn't want to type "Suitable for vegetarians" if it wasn't true! 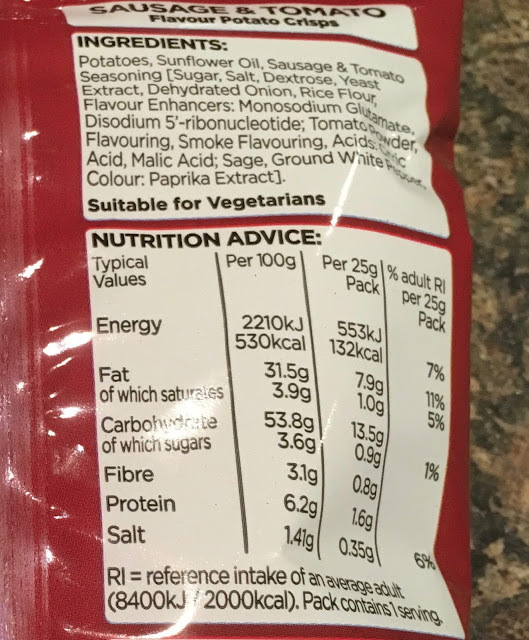 The reason why I'm more than a little surprised that these crisps taste of sausage is that so many 'sausage' flavoured crisps out there seem to substitute 'sage' for the vegetarian tastebuds, rather than try to emulate the flavour of sausage. I can't be bonkers though, as it says Sausage & Tomato on the packet! The 25g bag contains 132 calories, with 7.9g of fat, 0.9g of sugar, and 0.35g of salt. Suitable for vegetarians. Please see photograph for ingredients.